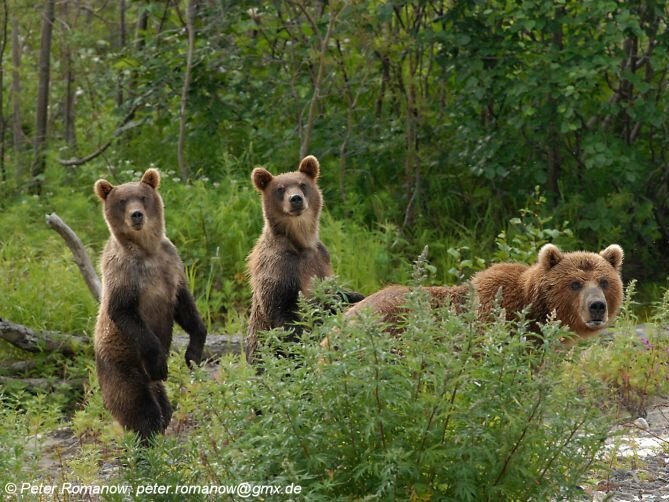 The Kamchatka brown bear or Ursus arctos beringianus is closely related to the Alaskan brown bear. It is also known as the Far Eastern brown bear and is possibly an ancestor of the Kodiak bear. It was classified as an Ursus arctos subspecies in 1851 by zoologist Alexander von Middendorff . Kamchatka brown bears can be found on the Kamchatka Peninsula, Karaginskiy Island, Shantar Islands, and Kuril Islands, in eastern Siberia. Their dens are often built under tree roots on dry slopes in September or October, about 30 days prior to hibernation. They may spend up to 6 months in hibernation. The Kamchatka brown bear's forehead is broad and is steeply elevated over its relatively short nose because of enormous sinuses. Its fur is long, dense and soft, and varies in color from pale yellow to blackish-brown to dull black. The bear's claws which are about 4 inches in length are a dark brown and sometimes have yellowish streaks at the tips. Males can grow up to 9 feet in length and weigh up to 800 pounds. Females can get up to 7 feet in length and 700 pounds. Males can be 50 to 53 inches shoulder height. Kamchatka brown bears can reach speeds of up to 30 miles per hour if necessary. 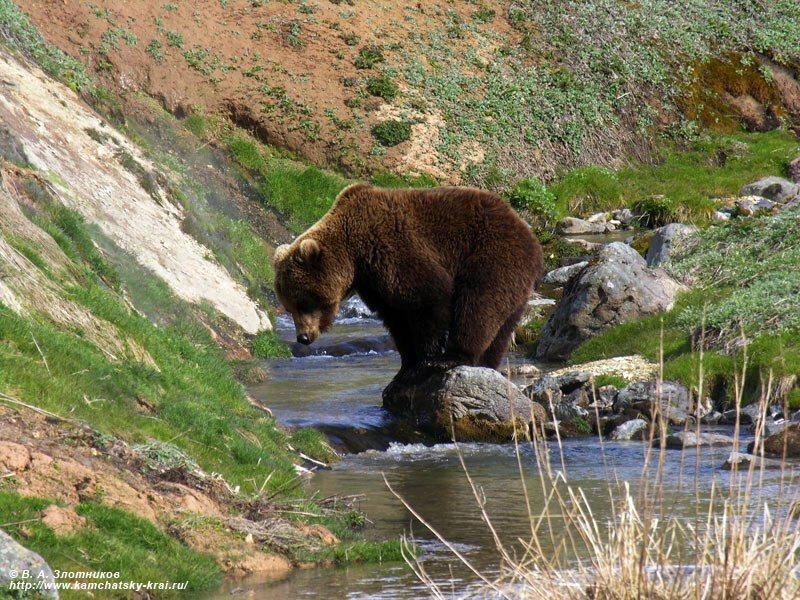 The large physical size of the Kamchatka bear is a result of having great access to sources of rich food like salmon, pine nuts and berries. It is of utmost importance that bears maintain their body weight in order to survive through hibernation. Because food is so accessible, the Kamchatka brown bears are of very little threat to humans. Only about one percent of all encounters result in an attack. Female brown bears in Kamchatka are capable of reproducing at about 4 years of age. Cubs are born in winter while the female is hibernating. Pregnancies will end before birth if the mother too poorly nourished to support her offspring. There are usually 2 to 3 cubs per litter. Females can produce offspring from different males in a single litter. Kamchatka peninsula is home to the highest recorded density of brown bears on Earth. Population estimates for the peninsula range from 10,000 to 14,000 bears. However, increasing human access through road development to expand mining and mineral exploration is fragmenting the bears' habitat. Kamchatka brown bears are now becoming rare in some regions close to human settlements. As many as 2,000 bears are killed every year by poachers who come for the bear's gallbladder that sells for hundreds of dollars in the Asian market to use for folk remedies. Also placing the bears in danger are fishing industries seeking profit in the salmon, and decreasing the bears' richest source of food. 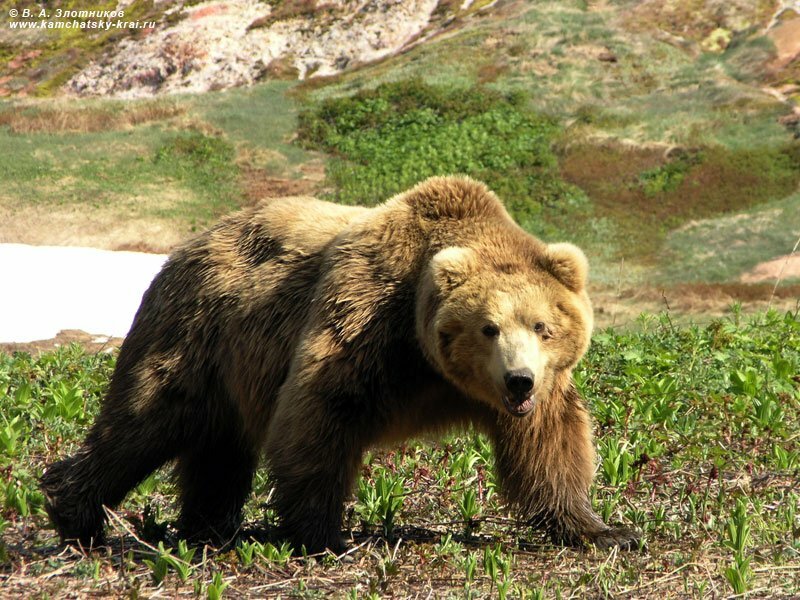 The Kamchatka brown bear is considered to be endangered.